Thomas Bertrand ‘s instruments are the fruit of almost a quarter of a century of experience: of in-depth study of the masterpieces of the Italian masters of the 17th and 18th centuries, intense exchanges with musicians and colleagues, analytical listening, an intimate relationship with music, mastery of techniques and styles, a profound knowledge of wood, and a constant quest for cohesion between materials, form, and function. To start with, there is the engagement with musicians, their aspirations, and their need to make these a reality. Thomas Bertrand patiently and sensitively analyses all their requirements. He chooses a model and designs the instrument that will best meet the needs they have expressed. 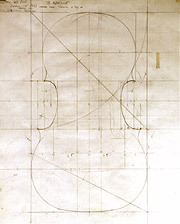 The first stage is the drawing of the mould, of the plans for the arching, and of the design and positioning of the F-holes, based on a proportional system analogous to that used by the great masters of the classical period. The outline produced in this way determines the general character of the instrument’s sound. Apart from the aesthetic aspect, the choice of wood also influences, among other things, the response and tone colour. Its growth, density, responsiveness, and cut – every parameter is of crucial importance. Thanks to the relations he has developed with specialised sawmills (in Italy, France, Germany, and Central Europe), Thomas Bertrand can chose from a wide selection of the best tone woods. For the construction of his instruments, Thomas Bertrand utilises, for the most part, the same techniques and the same tools that were employed by the violin makers of the 16th and 17th centuries. The frame saw, gouges, knives, planes, scrapers, rasps, files, dividers, marking gauge, purfling cutter, bending iron, etc. – all these hand tools have not changed over the centuries. The techniques used in varnishing the instrument make it possible to accentuate the aesthetic qualities of the wood, while also affecting the influence that the varnish has on its tone. While the composition of the varnish and the way in which it is prepared are important, there are a number of other important considerations: the way in which the surface of the wood is finished, the ground that precedes the varnish, its viscosity, the thickness of the layer, the way it is dried, etc. Thomas Bertrand uses a varnish with linseed oil and amber, which he prepares himself from the raw materials. He colours it with pigments from “home-made” madder. When the varnish has dried, the instrument still has to be set up: finishing the fingerboard, fitting the tuning pegs, trimming the nuts adjusting the soundpost, carving the bridge, and tightening the strings. Then comes a moment of intense emotion: the first sound! Over the first few months, a new instrument needs regular monitoring: its structure and materials adapt to the pressures of tension, to vibrations, and to the demands of playing. Some adjustments are needed, such as the replacement of the soundpost by a longer one or the adaptation of the height of the bridge. Quite soon, the instrument stabilises and visits to the violin maker become less frequent and finally become annual (as with any other instrument). The violin maker’s monitoring of the instrument makes it possible to achieve and to maintain its full potential. At every stage of the making of an instrument, intuition and sensitivity – backed up by experience and reflection – guide the choices made. There are so many possibilities that reason alone is not enough. At every fork in the road, all the senses come into play when it comes to taking the right option, consistent with the overall goal. The result in sound depends on all of these elements coming together. Let's meet and try out my most recent violin, viola and cello at the Contemporary Violin And Bow Makers Exhibition in New York From 27th to 29th October 2018 !